I'm not sure where to start on these anymore. Its just been so long... Its not that I haven't thought about it. I took the time to pick out enough artists and save all the websites to finish at 50... but whether for being busy with work, tired from work and getting ready for school, or general laziness/depression from being alive. Anyways... here I am again..trying to get back on track, so here it goes with an amazing artist~! 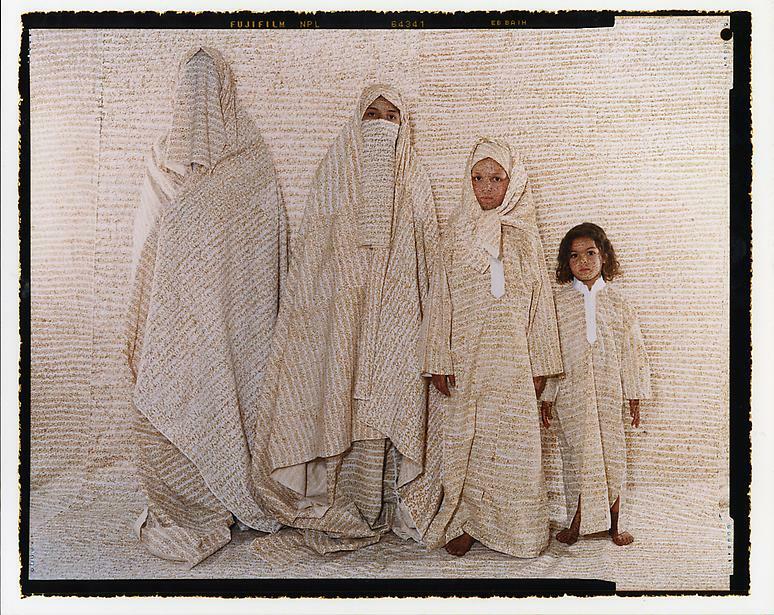 Lalla Essaydi is a photographer of fine art who was featured in the blog 500 Photographers. Yet she also does other sorts of media as well including painting and video. 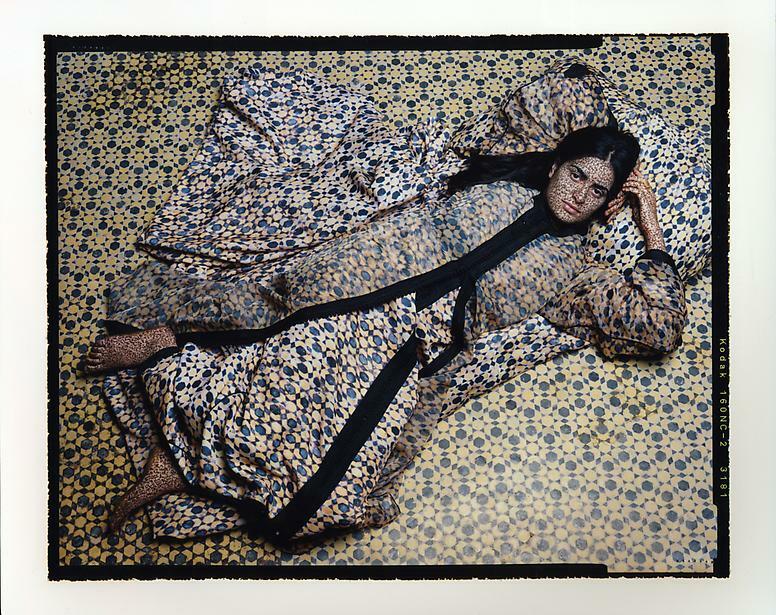 She grew up in Morocco and lived in Saudi Arabia for many years where she became inspired by the Arab women's complex identity. 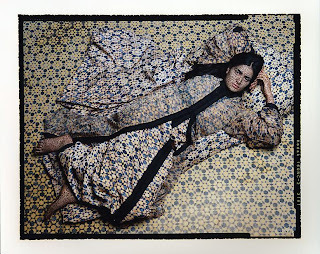 Currently Essaydi lives in New York and has been exhibited both nationally and internationally. 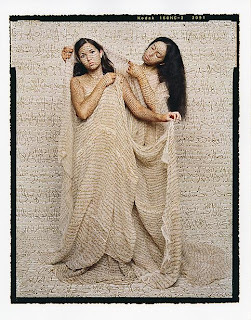 Many of her works are photographs of women draped in fabric that usually has the same pattern as the background. 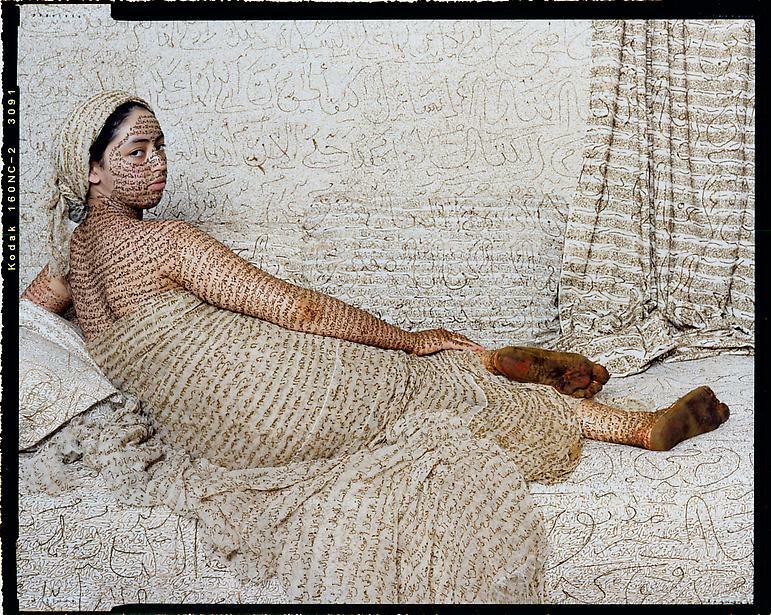 Other photographs depict the women covered in Islamic calligraphy on the fabric, background, and on their bodies in henna. These works are so beautiful and full of meaning. The calligraphy adds a new language of which to understand identity of these women. They also almost always seem to blend into the background with is so interesting. 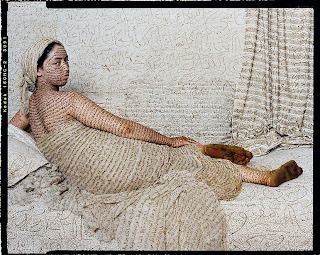 I love the use of written word is visual art. It always adds another level to what you are communicating with the audience. It reminds me of my use of braille as an element to paintings I did in Color Theory and will probably continue to use. 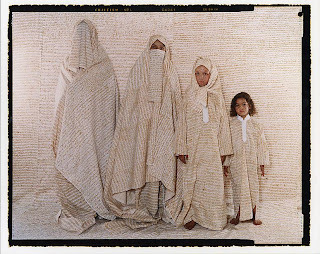 The images by Lalla Essaydi and the information about her and her works are from the Schneider Gallery website and Edwynn Houk Gallery and Lisa Sette Gallery.